The most common illness affecting the hands, which can lead to partial or full disability, is the Carpal Tunnel Syndrome (CTS). Over 75 million people suffer from CTS, mainly in the industrialized countries (Karjalainen A., Niederlaender E. 2004). The peak time during which this illness surfaces in people is between the ages of 35-60. Also, in the affected group, there are people of the working age (Popelyansky Ya.Yu. 2003). This problem occurs 3-5 times more often in women than in men (Berzins Y. E. 2003). The cause of CTS is currently unknown. Most of the researchers believe that the primary cause of CTS is long working hours with monotonous movement of the hands. This kind of work causes prolonged mechanical trauma on the wrist joint and the carpal tunnel. On the basis of this research, Liu et al. concluded that the carpal tunnel syndrome occurred in 1/6 surveyed people who worked on a computer. In today’s world, working on a computer is considered to be one of the basic factors which can lead to the development of CTS. The information field is full of accusations against the keyboard and mouse and have conducted extensive research in this direction. 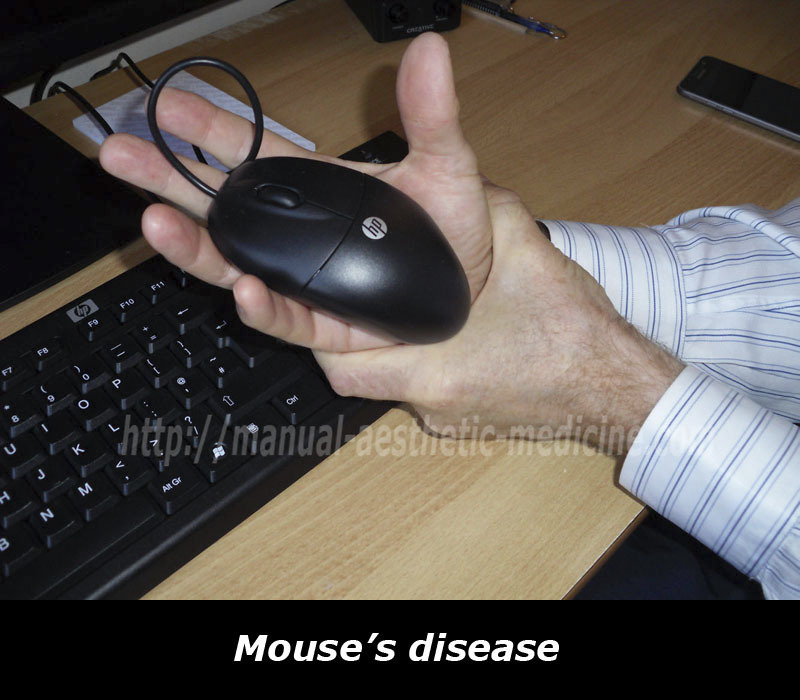 After that, an unofficial name appeared “Syndrome of the Computer Mouse” or “Mouse’s disease”. With this analogy, smartphones can be included as a risk factor. 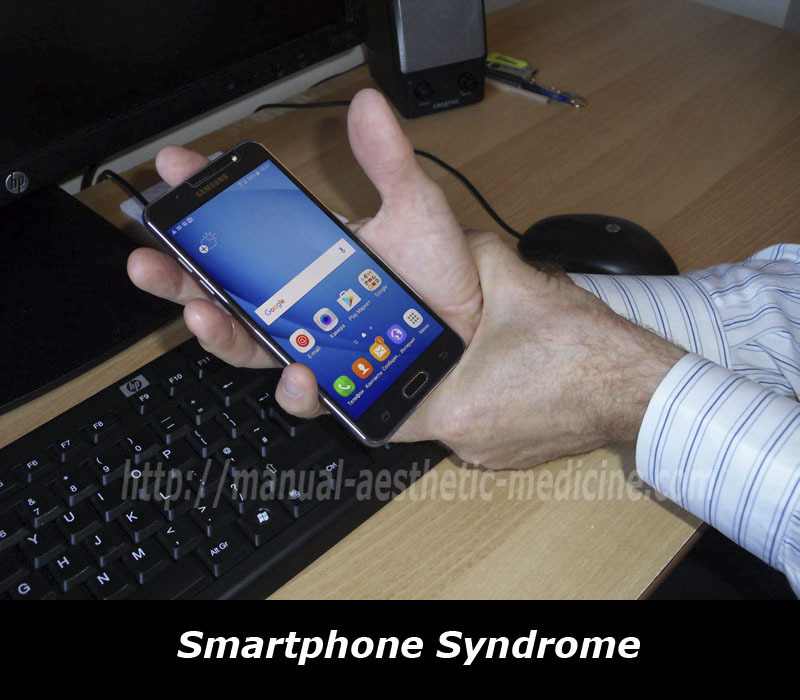 The newly queued name for CTS is “Smartphone Syndrome”. It seems unconvincing since the authors had only focused on the localized problem with the carpal tunnel. For example, how is it possible to explain the fact, based on the dominating “mouse theory”, the other hand can be affected when it had not had the chance to hold the “mouse” by its “tail”? According to Hanrahan, in the US, every year there are between 400,000 – 500,000 operations for CTS. The economic costs for this exceed $2 billion. 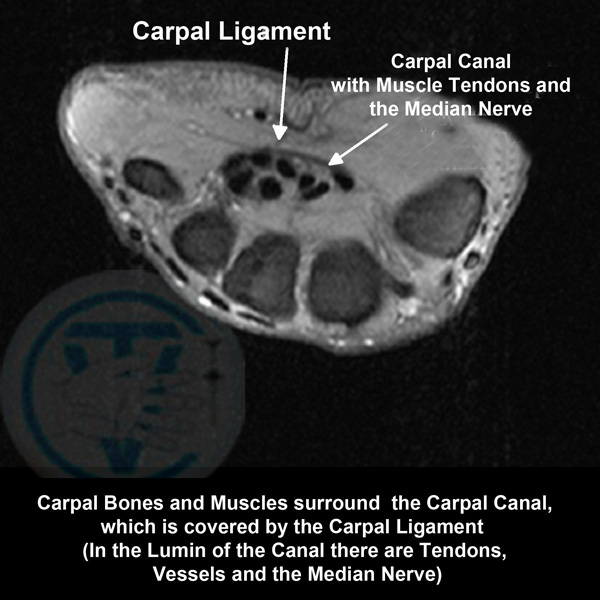 Other sources indicate that for the carpal tunnel syndrome, the fees incurred for one operation in the US are approx. $30,000. The problem with treating the patients in this category is far from being resolved. Since, despite the use of modern technology, the number of unsatisfactory results and relapse in the late post-operative period is 10-20% and sometimes more. 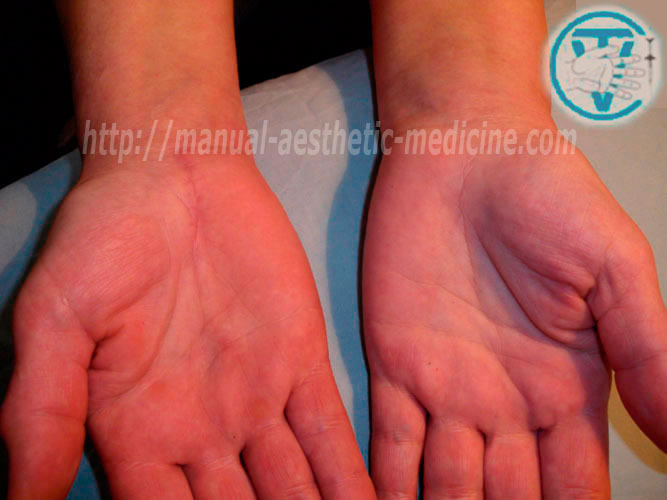 The major complications, following surgical procedure on the wrist with the purpose of decompressing the carpal canal, are: the formation of scar contractures, damage to the median nerve, wound infection (Mackinnon SE. 1991). From the shown data, we can see that there is an unclear prognosis with regard to the recovery of disturbed functions of the upper limbs. Oftentimes, the illness can lead to problems with household adaptation, incompetence at work, and sometimes disability. Therefore, it is important to continue developing effective methods for early detection of CTS and sound treatment. Carpal tunnel syndrome has many synonyms: entrapment neuropathy, ischemic neuropathy, traps syndrome, trapped neuropathy, and tunnel neuropathy. Definition (common version): CTS is regarded as one of the types of compression neuropathies. This is based on a local pinching of the median nerve at the point where it passes through the narrow anatomical tunnel under the transverse carpal ligament. The disease manifests complex pain, sensory, motor, autonomic and trophic disorders. 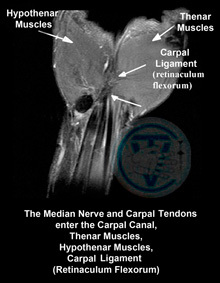 Carpal tunnel (carpalis capri.) is a narrow tunnel on the palm side with the size of 2cm in diameter. It consists of bones, muscles, and tendons of the wrist. Through the tunnel, the tendons, which allow you to bend your fingers and wrist, blood vessels, and the median nerve, pass freely. 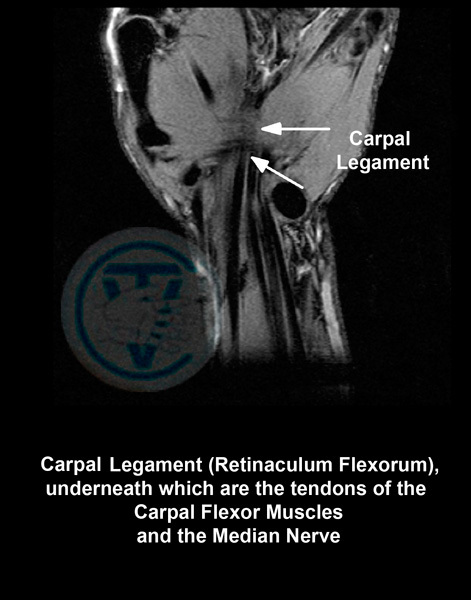 The top of the channel is covered by a large ligament (transverse carpal ligament) or flexor (Latin: Retinaculum flexorum). It is stretched between the radius and ulna, and appears as a strip of strong connective tissue. The purpose of the ligament is derived from its name (Retinaculum flexorum ) i.e. it serves to contain and protect the contents of the carpal tunnel: tendons, muscles used to bend the fingers and hand, blood vessels, and the median nerve. Outside of that, the ligament keeps the small bones in the wrist together for normal functionality of the hand and is a connective location for muscles which allow for the movements of the thumb and little finger. When the ligament is cut, these functions are either partially or fully lost. 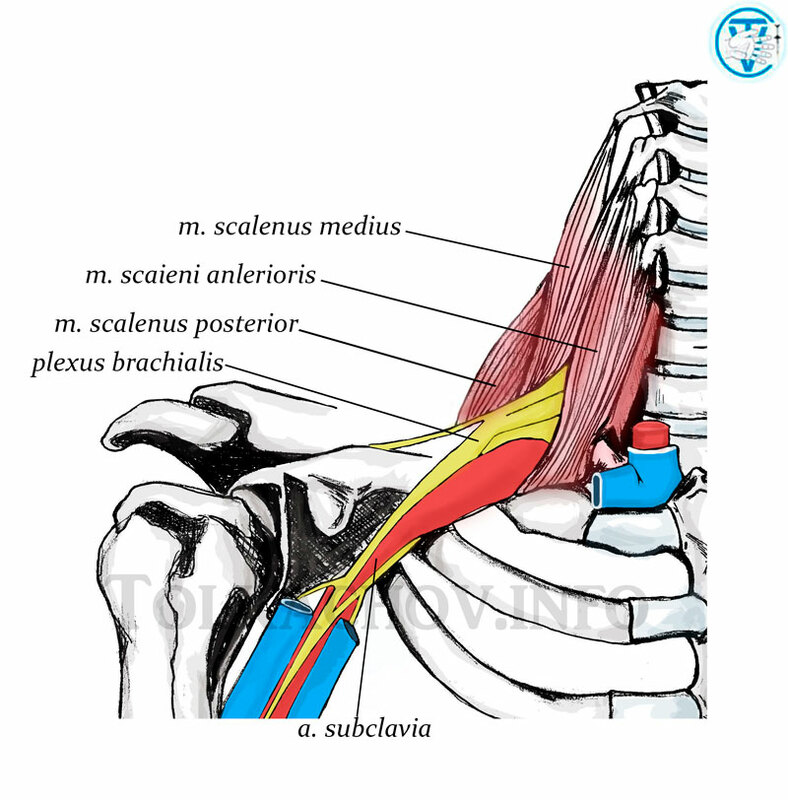 The median nerve (Latin: Nervus medianus), comes from the fibers of the lower cervical and first thoracic (C5 – T1) spinal roots and is formed by the merging of the lateral and median cords of the brachial plexus. 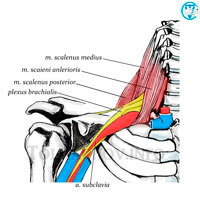 Brachial plexus is located, just as in the sphincter, between then anterior and middle scalene muscles, and one rib below. On the forearm, the nerve emerges between the superficial and deep flexor muscles of the fingers and gives them their branches. Then, through the opening of the carpal tunnel, it joins with the palmar surface of the hand along with the tendons of the flexor muscles. The channel nerve is the most superficial, directly under the transverse carpal ligament. After that, it is divided into branches and supplies the large area of the index, the middle, and the pinkie fingers. The median nerve is mixed. It consists of sensory, motor, and sympathetic fibers. The latter regulates the tone of the walls of the blood and lymph vessels in the wrist. To function properly, the nerve should be free to slip in the surrounding tissues and structures. During the movement of the extremities, the nerve is able to glide longitudinally within the few millimetres, which protects it from hyperextension (Kalmin O. V., 1988; Sunderland S., 1990; Lundbord G., 1996). Normally, the median nerve is not exposed to the compression of the carpal tunnel and the wrist movements do not disturb its function. As already mentioned, the CTS is considered as a result of the narrowing of the anatomical tunnel of the wrist with the development of neuro-channel conflict. [Al–Zamil M. H., 2008]. However, it is known that degenerative changes develop in the most mobile segments of the spine, thus the C4-C8 nerve roots are most affected at the cervical part of spine. 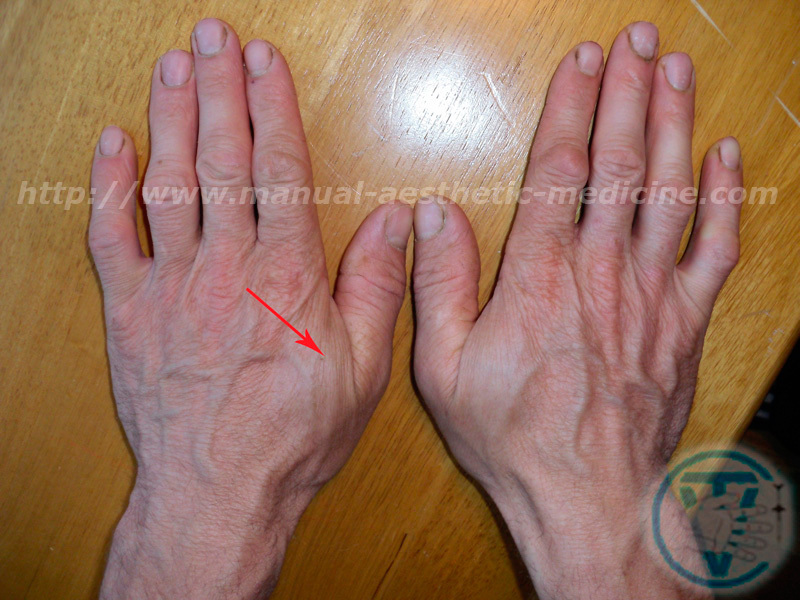 With the defeat of the C4-C5 roots is most characterized proximal paresis and C5-C8 – distal paresis of the arms with weakness and numbness of the fingers. That is, the compression of nerve's roots may be accompanied by not local only, but also distal (distant) clinical manifestations. At the same time, the local painful symptoms related to the area of roots compression could be mild or obscured by distant ones. According to Moskvitin A.V. research data (2011) the radiological examination (X-ray) of patients with tunnel syndromes in 90.8% of patients showed signs of degenerative-dystrophic processes in the cervical spine. MRI of 95% of the patients with the carpal tunnel syndrome had signs of the intervertebral disks lesions of degenerative-dystrophic nature. According to the author, one of the main predisposing factors to the development of carpal tunnel syndrome is a result of cervical degenerative disc disease. Work of Evdokimov S. I. (1982) showed that the compression of the spine and its membranes, there is a pathological change of the relationship between influence of sympathetic and parasympathetic divisions of the autonomic nervous system. This leads to disruption of blood supply (microcirculation) in the areas of their innervation, including muscle, nervous and connective tissue, often with the accession of edematous degenerative changes. Sympathetic innervation of the upper extremities is carried out at the level of T4-T7 (Petrukhin A.S. 2009). When lesions of the lateral horns of the spinal cord become affected (which can be observed with neck osteochondrosis), the vasomotor, trophic and secretory disorders in the zone of autonomic segmental innervation become evident. At the same time it is believed that the disease can be classified as multi-level neuropathies (double crush syndrome) and is regarded as a combination of nerve compression at several levels of its length A.R. Upton and A.J. McComas (1973). On our opinion such understanding of reason of disease is the most correct. 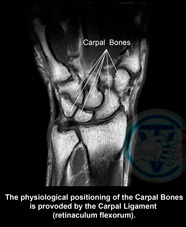 Based on the above, it can be concluded that CTS is not only a local problem in the wrist area. The components of the CTS are: osteochondrosis of the cervicothoracic part of spine (cervical spondylosis), muscular-tonic state of the muscles of the neck and shoulder girdle, as well as compression of the rootlets (C5-Th7) with the development of edematous-dystrophic process in the wrist region. The most commonly reported complaints and clinical manifestations of the CTS: the weakness of the hand, numbness in the fingers, and presence of paresthesias (tingling or pins and needles). Pain also accompanies the condition. It can be periodic, constant, aching, burning, and shooting. Painful symptoms are usually worse at night. The patient is forced to out of bed a few times to knead their hands, which can bring temporary relief. Increased pain can be provoked by any physical activity. As the condition progresses the wrist becomes harder to control, there’s loss of motor function. The patient experiences difficulty in carrying out even the simplest daily tasks. 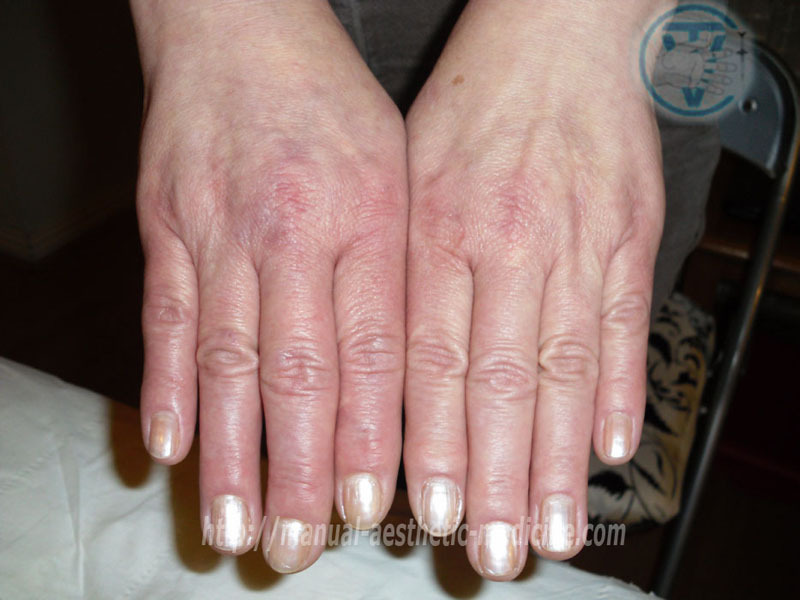 There is a possibility of vascular disorders, which appear as paleness or marble skin tone and swelling of the hand. 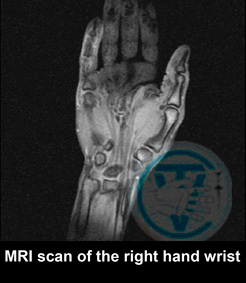 In advanced cases, the patient develops a muscle atrophy of the thumb (thenar) and the wrist appears like a “monkey’s hand”. Chronic pain, prolonged and frequent interruptions of sleep leads to depletion of the nervous system and development of neurotic disorders. Overview of individual complaints and clinical symptoms of Carpal Tunnel Syndrome (CTS). The majority of publications highlight muscular weakness in hands and loss of grip strength as one of the main symptoms of CTS. However, the grip function is not performed by the hand muscular ( simply because there are no muscles in the hand capable of performing such a function), but by the muscles in the forearm, the ligaments of which are attached to the phalanges. The innervation of the muscles of the forearm is provided by the median nerve. 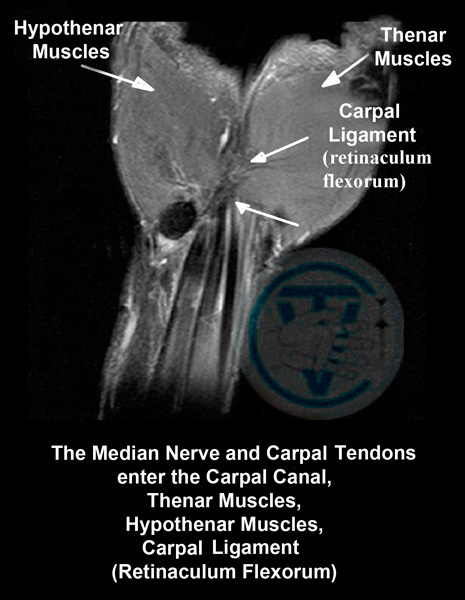 Thus, the point of innervation is located much higher that the carpal tunnel. The explanation of this can be found in any anatomy book. Therefore, the CTS diagnostic tests, based on measurements of strength of the hand are not informative. Pain increase in the horizontal position of the body at night time is considered to be one of characteristic symptoms of CTS. The explanation of the night pain increase given by Rudevik B., (1981) et al is that in the absence of physical activity the work of the "muscular pump" stops and the excretion of the fluids from the limbs slows down. As a result, the intra-tissue pressure increases compressing nervi nervorum. This also explains occurrence of paresthesia at night time. However the authors of this hypothesis do not take into consideration that the shape of the spine significantly changes depending on the position of the body (standing up or lying down), especially in its most flexible parts. In horizontally positioned vetrebrae, that changed their position increase pressure on nervous and soft tissue, which are already affected by osteochondrosis. Also there is no clear explanation as to why when the body is in a horizontal position the muscle pump stops working only on one hand, as CTS often occurs on both hands. First the symptoms occurring on one hand and later on, spreading to the other. It would be logical to suggest that the processes which all occur in chiral locations have the same cause: Cervical Osteochondrosis. When carrying out the treatment, we proceed from the fact that the cause of the CTS is the pathological process in the cervical and upper-thoracic spine. Changes in the carpal canal are secondary. At the same time, treatment is carried out on two levels: in the interval (C4-T7), which is justified by anatomical and pathophysiological features of the innervation of the arm and hand, and also in the wrist area, to eliminate local manifestations of the disease. To eliminate changes in the designated departments of the spine, we use: manual therapy (sliding-pressing method is preferable), mesotherapy and methods of physiotherapy. Locally, in the field of the carpal canal: massage, mesotherapy and physiotherapy. The result depends on the duration of the process and the presence of concomitant diseases. Our treatment shows high efficiency, which confirms the correctness of the chosen approach. Patient N had an operation to cut the carpal ligament on the right wrist with the purpose of decompression of the median nerve (visible postoperative scar). In the pictures we can see the residual effects, a year after the operation: presence of edema, more pronounced on the other hand, signs of vascular dystrophy as we can see the marbling of the skin. When testing the patient’s strength, right arm (operated) is weaker than the left. 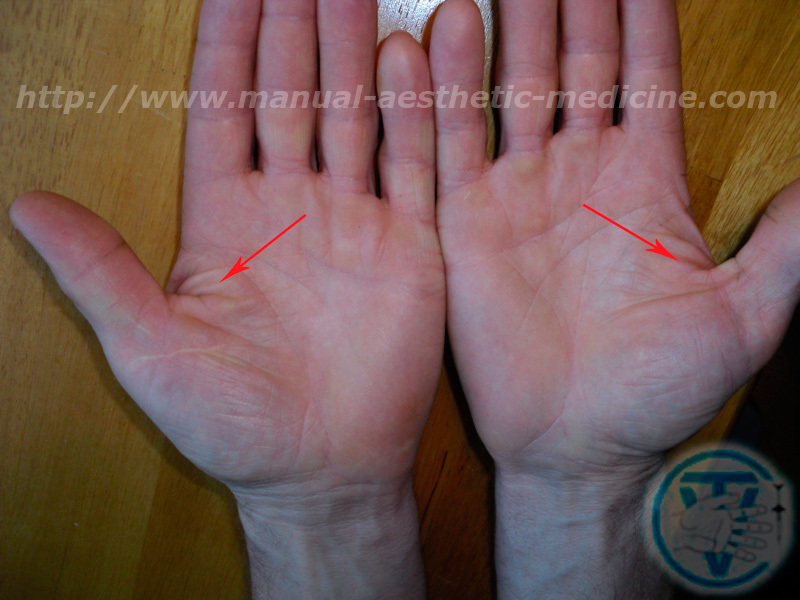 Due to the presence of carpal tunnel syndrome in the left hand, the patient is queued for a similar operation. Currently, the patient is being treated at out centre, according to our methodology. 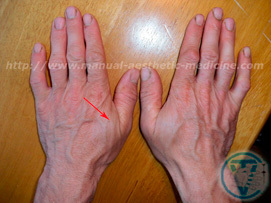 Goal: removal of residual effects after undergoing surgery on her right hand, removal of pain, and recovery of functionality of the left hand (without surgery). 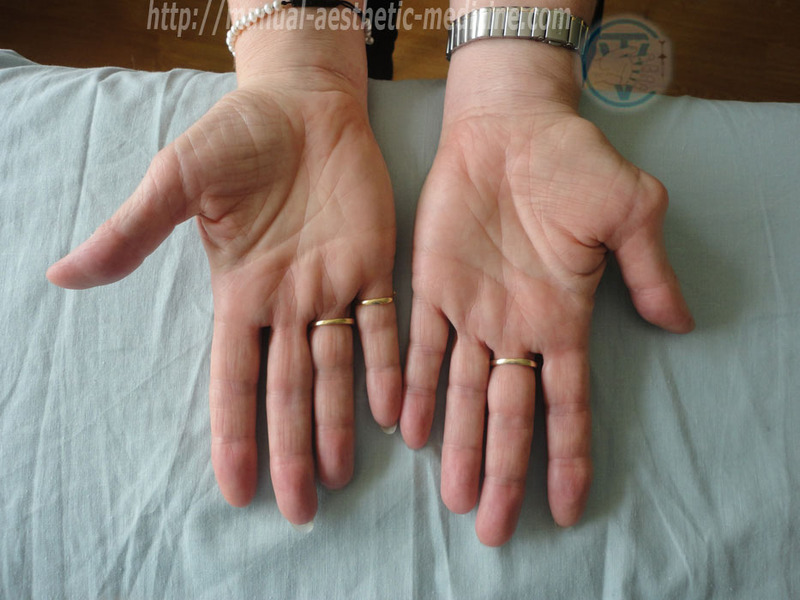 Edematous degenerative disorders of the soft tissue in the right hand a year after undergoing surgery.